Highly recommended. It’s simple to use, but much more flexible than other training software I’ve used. 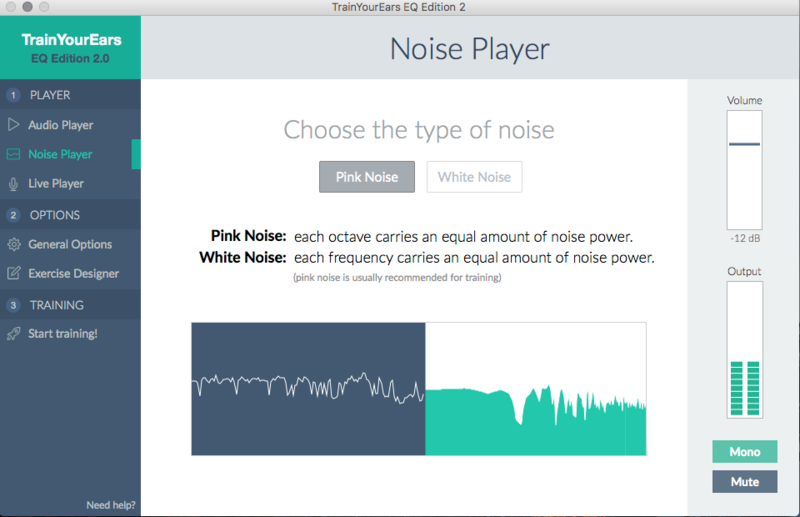 TrainYourEars 2.0 (TYE) is a clean, simple application for Mac and Windows that can teach you to listen for EQ adjustments in sound, to help you zero in on your frequencies as you’re mixing. TrainYourEars is a simple one window affair, easy on the eyes, with 3 steps to training. Once you begin your training, it’s just one test at a time, and you reset. TYE keeps a tally of whether you’re correct or not, and gives a percentage score of the last 50 tests, so you’ve got a good idea of how good you are/how much you’ve improved. 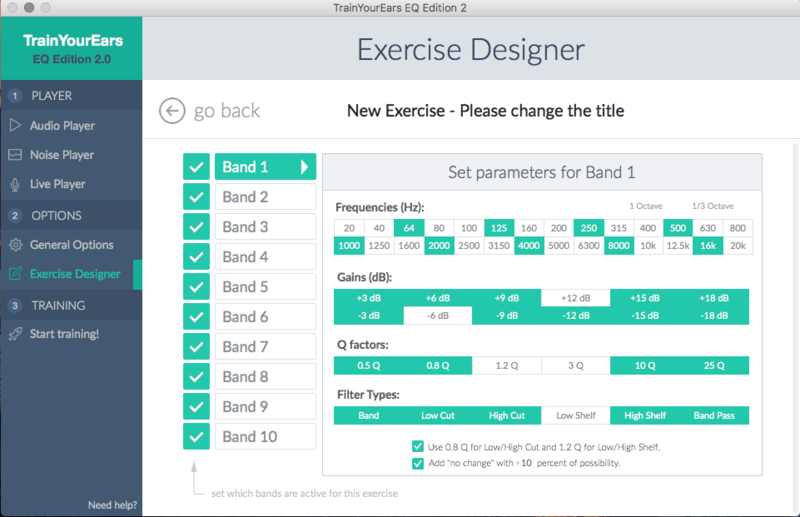 TrainYourEars comes loaded with 13 example tests, which are perfect to get you up and running. Starting at the top is the simplest; guess basic band boost and cuts, where the sound is played, and one of 7 EQ bands shown is boosted or cut. You can flick between the original sound, and the EQ’d sound, and gradually hone in with your ears on what has changed. raise or lower the band you think has changed, and hit solution. 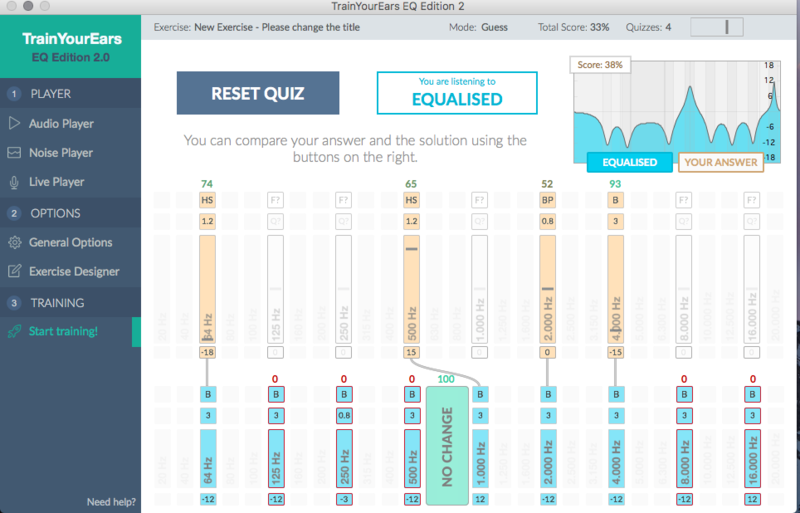 You can see with a graphic EQ image in the top right hand corner the correct solution and your answer. Once the answer is up, you hit ‘reset’ button, and away you go again. TYE logs every test, and the percentage will change accordingly. And so on. Not only does TYE test simple frequency band boosts and cuts, it tests shelves, band pass filter, resonant filters (like on a synth), and also the way an entire 5 or 7- band graphic EQ would affect the sound. It quickly becomes apparent that TYE has the potential to upset anyone who thinks they can hear the slightest eq adjustments! If that’s not hard enough, you can quickly find your listening weaknesses, and then design and save your own tests to improve those skills. With the test designer, you can choose what parameters are going to be altered, and can make it as simple or as difficult as you like. At the most difficult end, you can be trying to decipher up to 10 changes from 28 different frequency bands from 20Hz to 20kHz, 12 different volume levels (+3, 6, 9, 12, 15, 18 and the same levels in the opposite direction), 6 Q-factors, and 6 different filter types, all in the same test. I would suggest that would be nigh on impossible for anyone to get 100% right. So there’s room for everyone to grow!! At the simplest end, you could select two bands that are adjusted either 18DB gain or cut. Once you’ve edited your exercise, you simply save, and start training yourself. TYE does the rest. As a mix engineer, it’s important to keep learning; keep improving on your skill set. EQ is one of the most important skills a mix engineer needs to dedicate time to master. And it’s extremely fast with TrainYourEars 2nd version. 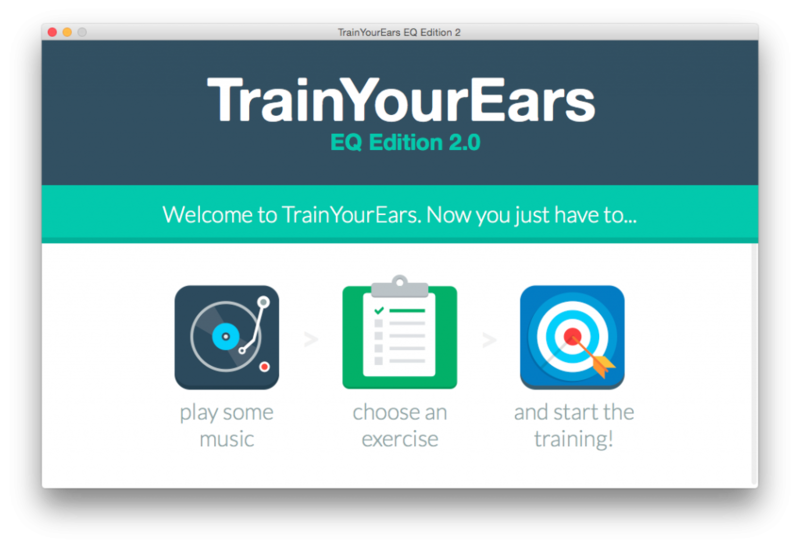 TrainYourEars is simple to use, but much more flexible than other training software I’ve used, coming with different variations and complexities of ear training which is both useful for the beginner and the expert. I love the fact you can design your own exercises, so once you’ve mastered the beginning set of 13, you can devise your own test, and make it as devilishly hard as you like. I used it half an hour a day for a week solid, and I was shocked at how improved my listening skills were at the end of that week. Whether it will ruin my ability to just listen to music for enjoyment, we’ll have to see! But as a mix engineer it’s an incredible tool. Highly recommended. If you’re not convinced by my review, take it from the dozens of prestigious universities that use it to train their students. The price has just been reduced to 49 euros, roughly $50. For more information, see here.